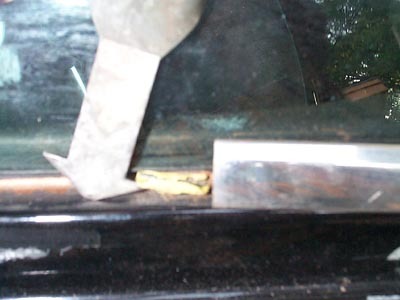 To remove the front and rear windshields requires the same techniques and tools. First item to remove is the stainless trim around the windshield. You need to lay a towel on the glass and then slip the trim removal tool under the trim while the tool rests on the towel. A small washcloth works great. The washcloth will prevent the tool from scratching the glass as you work to release the clips holding the glass in place. For the front windshield remove the cowl stainless trim which is held in place by 5-6 small Phillips head screws. 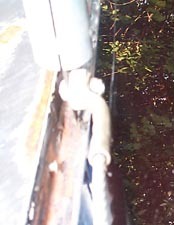 The tool will slide under the trim and then the hook portion will catch on one of the clips(see pic below.) Gently pull the tool away from the clip towards the center of the windshield. 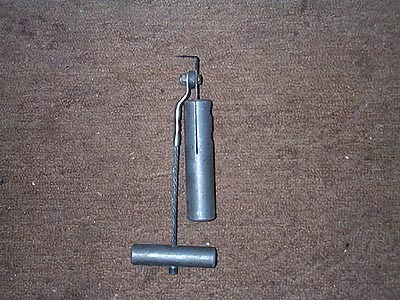 When the clip releases, a "pop" will be heard. Continue the process for each stainless trim piece. 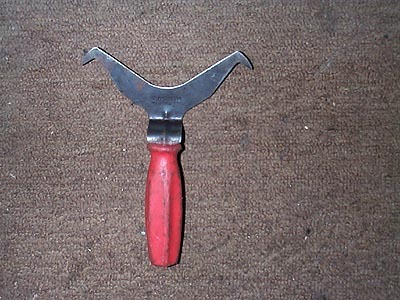 The tool is available at most auto parts stores. Once you have the trim removed, use a utility knife to cut the butyl window seal along the entire perimeter of the windshield. Also, disconnect the radio antenna. Now it is time to use the cold knife. Available at specialty tool stores. Costs about $12. 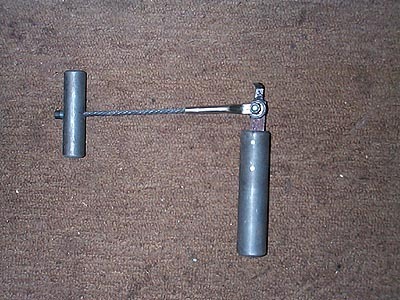 Place the 90 degree blade into the channel between the metal frame and the windshield. Gently rotate the handle so the blade will rotate under the windshield and into the butyl material. It is very important to keep the blade parellel with the windshield frame (handle is to be kept perpendicular to the glass surface.) Now use the T-handle to gently pull the cold knife through the butyl material. Take your time and you should be able to cut the butyl material in about 5 minutes. 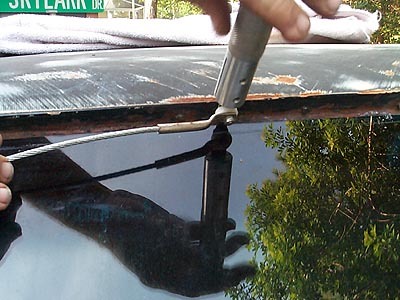 Once the butyl is cut, enter the car and gently push out the windshield from the top center. There are two factory rests located on the cowl that will hold the windshield in place as you press the windshield out. You can have an assistant hold the windshield in place until you get out of the car and each person can grab the windshield on the side and place it in a safe location until it is needed for installation. To clean the butyl material, use a putty knife to remove as much material as possible. Use mineral spirits to clean any remaining residue. Now is the time to repair any rust in the cowl area or windshield channel. Also, it is a good time to paint the metal portion of the dash if needed.